Chef’s tip: this petit gateau can easily be transformed into an entremets. Melt Anëo 34 % white chocolate and butter on a bain-marie. Whiten eggs with sugars and add previous chocolate mixture. Whip egg whites with 160 g sugar and fold into the batter, finishing with sifted flour. Bake at 180°C for 9 to 11 minutes. 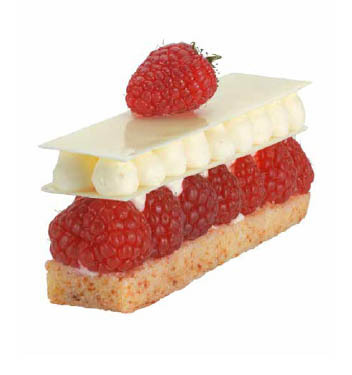 Chef's tip: to diversify the textures, change the white chocolate sponge with a shortbread. Boil cream with invert sugar and tonka bean. Pour onto white chocolate and mix with a hand mixer. Refrigerate for 24 hours before whipping for the finishing. 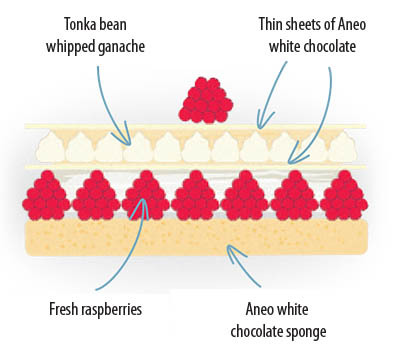 Cut the top of the sponge, pipe whipped ganache, fresh raspberries and place thin sheets of white chocolate. Temper white chocolate. Spread onto 2 acetate sheets and cut 12 cm by 3 cm rectangles. Unleash your creativity, for example add luster dust to the white chocolate.